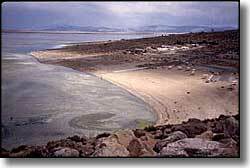 10,000 years ago (during the last Ice Age), Ancient Lake Lahontan covered some 8,500 square miles of western Nevada. Walker Lake is one of the few remaining pools of that ancient inland sea. Walker Lake State Recreation Area offers swimming, fishing, boating, picnicking (shade ramadas with tables and campfire grills along the sandy beach), and restrooms. The recreation area is open year-round and is located about 11 miles north of Hawthorne off US Highway 95.